The Salvation Army Soup Kitchen is one of many vital social welfare services the Salvos provide to Perth’s homeless, along with refuges, clothing supplies and support to help put vulnerable lives back on track. Every day of the year, the Soup Kitchen van heads out to two locations in Perth to hand out tea, coffee, hot chocolate, soup, sandwiches, fruit, sausage rolls and pies to approximately 40 to 80 homeless people who are sleeping rough. For many, it may well be the only meal they get until the van arrives the next day. For many years, the Soup Kitchen has been funded by collections made by an elderly lady who shakes her tin outside the Perth railway station each day. This isn’t a sustainable strategy, so we want to do all we can to ensure this vital service continues to support Perth’s most vulnerable. Volunteering time: Every Tuesday, two members of the OneIT team volunteer at the Salvos’ Soup Kitchen to help prepare food, load up the mini bus, deliver and serve food and drinks to the homeless. Volunteering expertise: We offered our dev team’s technology know-how for free to improve efficiency through the development of a new fully-customised booking system. Read the Salvo’s booking system case study. Volunteering to fundraise: We’re tackling the Chevron City to Surf for the second year running. Last year we raised $5,000 for the Soup Kitchen, and we’ll be aiming to double it this time around. Updates and fundraising page coming soon. If you’re interested in volunteering your time, resources or professional expertise to the Salvos, or would like to make a donation to support their inspiring work, please visit the Salvation Army website or contact Keira Swayn on 08 9260 9513 08 9260 9513 for more details. 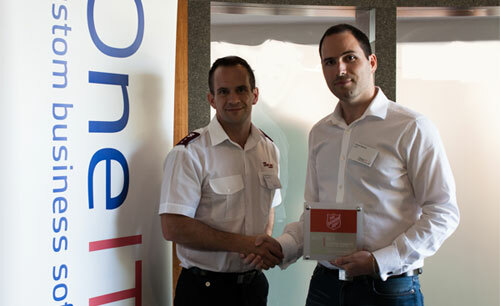 In February 2014, the Salvation Army surprised the OneIT team with an award in recognition of our support for the Soup Kitchen. It’s got pride of place in our reception.